I have a new start to report! 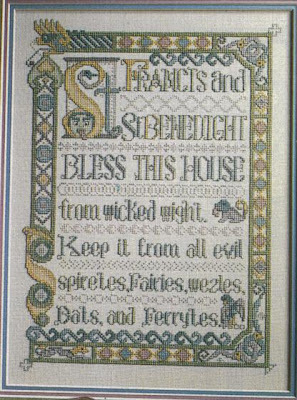 I have decided on Illuminated House Blessing by Patricia Andrle. I love her designs. I have several of them waiting to do in my stash! I made a small start on it. I am using DMC with some Kreinik blending filament on Antique White Permin/Wichelt. Before I started it I was trying to think of a way to change some of the colors. There are a lot of pastels, light greens, and lavenders. I would have prefered to see some more vivid colors, blues, and a touch of red. I couldn't work out how to introduce those colors without changing everything, so I left the colors as they were designed. I have actually gotten a bit further along since I took the picture. 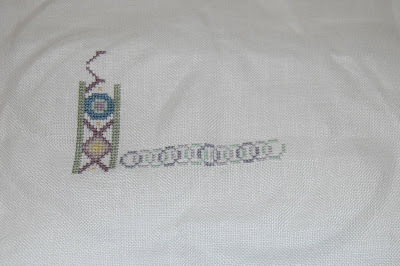 I think this will be a slow stitch because there is just a ton of back stitching! Almost every area needs to be back stitched. This looks like one of those designs that looks deceptively simple and is actually quiet complicated. I shall watch with interest.